Come relax in the newly remodeled private home located just a HALF of a Block from the main beach area of Ocean Beach Park (near Lifeguard Tower 5 just south of Dog Beach). This beautiful home boast a total of 4 bedrooms / 3 baths (split between the 3-story house 3/2 and a detached beach cottage in the back yard 1/1). The entire property is private with a 6 foot privacy fence around the backyard. 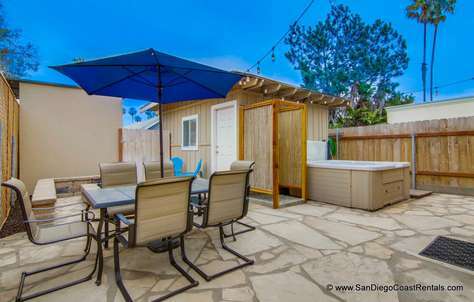 San Diego is known for its perfect weather and sunshine so you will spend most of your time relaxing in the newly landscaped outdoor space using the private Jacuzzi tub, the built in gas fire pit, or the outdoor gas BBQ Grill. This home will sleep up to 13 guest (10 adults max) and is ideal for families (or multiple families) who want the privacy of a single family home with a yard, as well as about a 1-2 minute walk to the sand at Ocean Beach Park. The location of this home allows for quiet evenings under the stars as well as panoramic views of the ocean while listening to the sounds of the waves crashing ashore. There is also off street parking for up to 3 cars in the driveway parked tandem. Once you have experience living like a local while vacationing here, you'll already be in discussion about what week you want to return the following year to rent this one of a kind vacation home.